Vieillot mentioned that this weaver had been collected at Congo et Caconga, one of three historic provinces in Cabinda, Angola. The chestnut-fusous Weawer (Reichenbach 1863) [originally given as Black and chestnut Weaver-bird (Burton 1883)]. Identification. 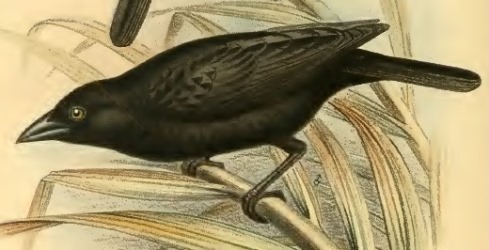 The Vieillot's Black Weaver Ploceus nigerrimus is named after its black colour. The adult male is wholly black (nominate race, photo above right) or black with chestnut back, rump and belly (P. n. castaneofuscus, photo above left). The yellow eye distinguishes it from other black weavers - Maxwell's Black Weaver has a whitish eye, and the female Cassin's Malimbe has a dark eye. The female and juvenile Vieillot's Black Weaver are olive with a little yellow on below and streaks on the back, and the eye is pale. 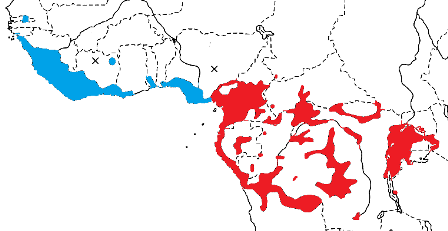 P. r. nigerrimus in extreme SE Nigeria to Uganda and W Kenya, south to Angola and Zaire (see red on map). P. r. castaneofuscus, Chestnut-and-black Weaver, in Sierra Leone to E Nigeria (see blue on map). 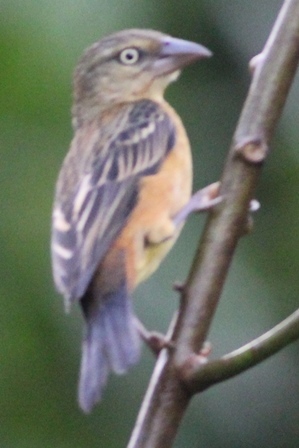 The male of this subspecies has black and chestnut plumage. These subspecies were originally described as distinct species but have long been regarded as conspecific. They interbreed in southern Nigeria where their ranges meet. Habitat. The Vieillot's Black Weaver inhabits forest clearings, often in villages, wooded areas and high grass savannas, although not found in forest. Food. The Vieillot's Black Weaver feeds on mainly insects (grasshoppers, winged ants, winged termites, caterpillars and butterflies); also seeds, fruit, berries and nectar. Birds move far from their colonies to forage in savanna and gallery forest. They regularly join mixed-species flocks of insectivores foraging in more open forest areas. Nigerian birds search areas where squirrels Funisciurus anerythrus have been feeding, and collect the outer fibrous layers of oil palm nuts which the squirrels discard. Breeding. 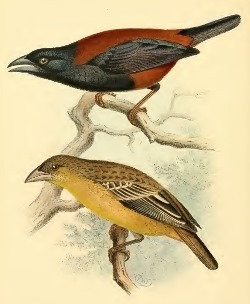 The Vieillot's Black Weaver is colonial (photo left, from phown 4209), gregarious, territorial, and polygynous, with up to 5 females in a males' territory. Breeding activity seems to coincide with rainfall. Some females synchronise nesting, while others do not. It forms mixed colonies with Village Weavers and the 2 species sometimes hybridize. Village Weavers appear to select the site which is later joined by Vieillot's Black Weavers. Vieillot's Black Weavers do not respond to bursts of activity by Village Weavers in the same colony. To advertise to females, the male Vieillot's Black Weaver hangs below his nest entrance, quivering his wings. The male Village Weaver has a similar display, but beats his wings rather than quivering them. Colonies occur in trees, reeds, bulrushes, papyrus (photo right, from phown 871), or bamboos. There may be several nests in the territory of one male, which may be part of a colony of dozens or hundreds of nesting weavers. The oval nest is similar to that of the Village Weaver but lacks the entrance spout. It is built by the male, taking about nine hours to complete. In general, building activity peaks before 11h00 and a colony is almost deserted from 12h00 to 15h00; activity resumes in the late afternoon. A particularly interesting PHOWN record is of a young python resting on the nest of a Vieillot's Black Weaver (photo left, from phown 2448).